Manufacturing is an important part of New Mexico’s economy. According to the National Association of Manufacturers, the total output from manufacturing is $5.9 billion and the sector’s share of total gross state product is 7.4 percent. 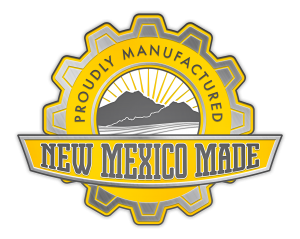 New Mexico MEP is proud to support our state’s manufacturers and is honored to launch the New Mexico Made program! The mission of the program is to inform the public about the incredible variety of products manufactured in The Land of Enchantment and provide manufacturers with resources to help them thrive. View the Products Made in New Mexico in our Online Directory by clicking the button on the right. Can you imagine the positive impact we could have on our state’s economy if we only bought locally-made products and worked with companies located in New Mexico? Now you have an easy way to “keep it in our state” with the New Mexico Made online directory! Whether you’re a business searching for a nearby supplier or an individual looking to buy goods from local vendors, browse through the New Mexico Made directory on the left-hand sidebar of your screen. Yes, you now have a convenient way to view all of the great products made in our state. Become a Program Member for Free! New Mexico’s manufacturers can become a part of the program at no cost. When you join the New Mexico Made program, you get listed on our online directory and receive various benefits for free. Your online profile can serve as a mini-website for your target audience. To register as a participant, click “Join the Program” on the right hand side of this page. For any questions regarding the New Mexico Made program, please contact Claudia Serrano at claudias@newmexicomep.org or 505-314-9131.